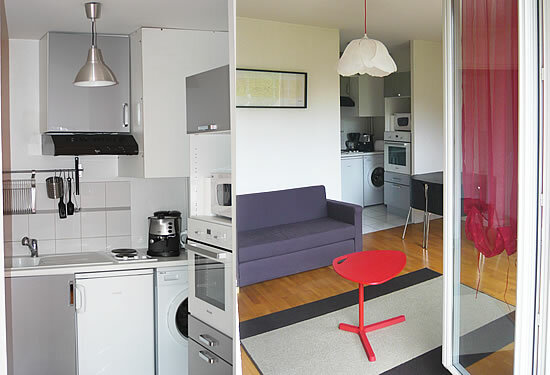 In the heart of the popular neighborhood of Croix Rousse, this self catering apartment is a 29 sqm furnished studio located on the 2nd floor of a recent residence. Calm and sunny, the rental overlooks a courtyard garden. Completely renovated, the furnished apartment offers great comfort (3 keys Clevacances) and can accommodate up to 3 or 4 people. It includes a living room with a murphy bed and a sofa bed, a fully equipped kitchen and a bathroom with shower and toilet. The vacation rental is located 50 meters from the Place de la Croix Rousse, in the heart of this famous neighborhood where silk workers lived for over 150 years. The silk workers weaved on the Jacquard loom to produce rolls of cloth which were then brought to Lyon tailors. They carried the rolls on their backs, and to avoid rain, they crossed through the famous traboules, the alleyways of buildings. Christine and Pascal are pleased to welcome you and are at your disposal to make your stay as pleasant as possible. Enjoy your stay in Lyon! Address: 6 rue des Pierres Plantées, 69001 Lyon (click here to locate the studio on a map). The self contained flat is 20 m from the Boulevard de la Croix Rousse where a market is held 6 days a week. This boulevard is the boundary between the 1st arrondissement (les pentes) and the 4th arrondissement (le plateau). In the heart of Croix Rousse animated neighborhood, the apartment is 5 minutes from Place des Terreaux and City Hall. Public parking is at 3 minutes walk and bus and subway stops are just down the building. It is ideally situated to explore all tourist sights of Lyon.